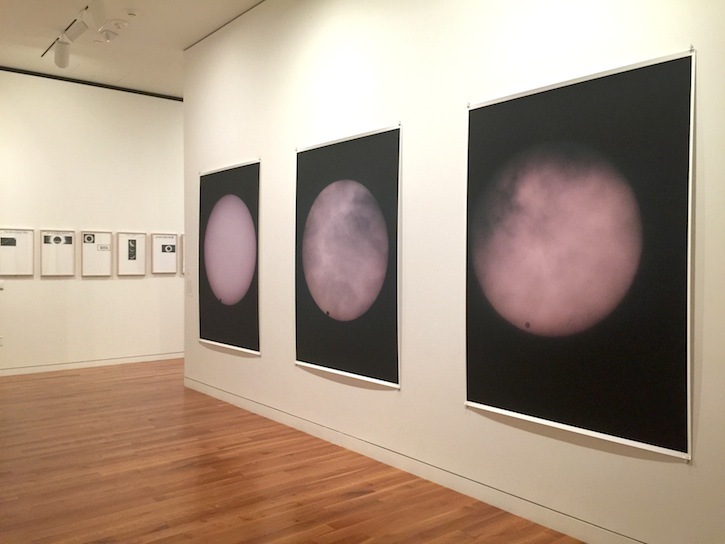 The Sun Placed in the Abyss, an original exhibition on view at Columbus Museum of Art, features 50 contemporary artists and collectives who explore the essential relationship between photography and the Sun. Pictured here: Arc of Total Eclipse by Sarah Charlesworth (left) and Venus Transit by Wolfgang Tillmans (right). “What is the sun?” inquires Francis Ponge in the introduction to his poem Le Soleil placé en abîme, translated into English as The Sun Placed in the Abyss. Of course, Ponge already knew, like we do, that the sun is the star at the center of our solar system, the major source of energy for life on Earth, and the basis for our organization of time—“that which dominates all things, and, therefore, cannot be dominated,” he concludes. Thus, what Ponge is really asking is how one begins to describe or represent the sun, especially when it is nearly impossible to look at. For the poet, to contemplate the sun is to address the very conditions of existence and representation. Taking its title and fundamental question from Ponge’s poem, the original exhibition The Sun Placed in the Abyss brings together the work of nearly 50 intergenerational artists and collectives who, since 1970, have similarly used the sun to contemplate the historical, social, and technological conditions of photography and the world around it. In the terminology of French heraldry, the abîme, or the abyss, is the center of a coat of arms. To place the sun in the abyss, then, is to place it in the center: a heliocentric model not only of our universe but also of our artistic and intellectual production. Yet “placed in the abyss” has another meaning in French: mise en abyme is a formal technique in which an image is made to contain a copy of itself, or rather to reflect upon itself. In many of the works included here, artists use the sun not only as the central subject but also to produce a self-referential image using sunlight. This exhibition focuses on art made since 1970, but photography has been dependent on the sun since its inception. The word “photography” means “writing with light,” and early inventors and practitioners referred to photographic processes as “heliography” (sun drawing) and “sun pictures,” conferring agency to the celestial body in the creation of mechanically produced images. The photographic apparatus evolved from the camera obscura, an optical device that was used beginning in ancient China and ancient Greece to observe solar eclipses, and which became one of the dominant principles of vision in Europe by the seventeenth century. When Galileo observed sunspots, for example, aware that observing the magnified sun directly would blind him, he allowed the solar image to fall through his telescope onto a piece of paper. Like a camera, he traced the elaborate chiaroscuro of the blemishes. Soon after the invention of the daguerreotype in 1839, scientists sought to capture images of the sun with a camera. The first detailed photograph was made on April 2, 1845, by the French physicists Armand Hippolyte Louis Fizeau and Jean Bernard Léon Foucault—who also pioneered the technique for measuring the speed of light. Taken with an exposure of one-sixtieth of a second, the image not only depicts sun-spots—areas of intense magnetic activity—but also turns our sun into just another star in the sky. Since then, as Jordan Bear discusses in his essay in this volume, photographic technologies have become indispensable to our understanding of solar phenomena, and numerous artists, from Sarah Charlesworth to Linda Connor to Lisa Oppenheim, have repurposed these images. In the new “New Romantics” section of The Sun Placed in the Abyss artists incorporate images of sunrises and sunsets to highlight issues of aesthetic taste and the material conditions of photographic technologies, from postcards and tourist snapshots to magazines and cellphones. 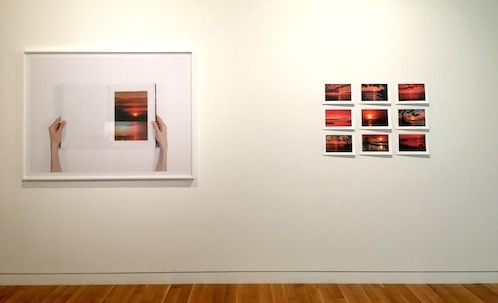 Pictured here: Work by Anne Collier (left) and Hans-Peter Feldman (right). The exhibition is divided into three thematic sections. In the first section, “Archaeologies of Knowledge,” artists explore the intersecting histories of photography and science, from the nineteenth century to today. Many of these works overlap with what the art critic Hal Foster has identified as a resurgence of an “archival impulse” in contemporary art, which seeks to make historical information, often lost or displaced, physically present. The second section, “Into the Light,” showcases artists who have pointed their camera at the sun or used sunlight as a medium itself. For many of them, the sun has provided the perfect universal and fixed thing from which to explore subjectivity, vision, and representation. In the exhibition’s final section, “New Romantics,” artists incorporate images of sunrises and sunsets to highlight issues of aesthetic taste and the material conditions of photographic technologies, from postcards and tourist snapshots to magazines and cellphones. Many of these artists re-photograph or alter existing images. Toward the end of his poem, Ponge ultimately concludes that it is not possible to contemplate the sun directly. Only through its surrogates, its metaphors, can it be understood. He declares, “The BRIGHTEST of all objects in the world is—consequently—NOT—is not an object; it is a void, the metaphysical abyss.” While this exhibition highlights an enduring interest in the sun in contemporary photographic practices, it does so circuitously, reflecting back on photography and the world around it. To photograph the sun is to consider “all things under the sun,” and these artists are not afraid to stare into the abyss. – Drew Sawyer is the William J. and Sarah Ross Soter Associate Curator of Photography at Columbus Museum of Art, and the Curator for The Sun Placed in the Abyss.